Introducing our first security kit with a SR751 RF Repeater included! 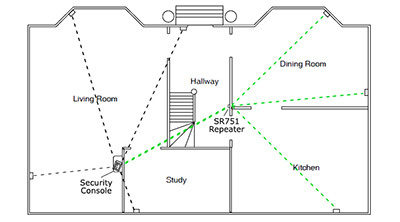 The SR751 RF repeater receives and repeats 310 Hz Radio Frequency signals improving the clarity and range of these units. This is great for the X10 security systems as they all operate via RF frequencies! 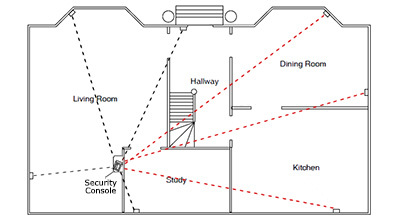 In the first example, since the console was placed on the far side of the house, some of the X10 wireless units either have connection issues or are not able to connect at all. This is remedied in the second example by placing a SR751 repeater in between those far units and the console. The RF is picked up by the SR751 and repeated with a fresh signal and picked up by the console.